First airing on FOX Friday, October 26, 2007, episode 22 of the myrtle beach TV series entitled, "Coffee Break" opens in Ocean Isle Beach during the North Carolina Oyster Festival. Marcia talks with Brunwick County Chamber President Cathy Altman about the festival and the area. Viewers then get a peak of Little River off the deck at Key West Crazy, were singer Doug Fank entertains customers overlooking the Intracoastal Waterway. We then take viewers down to Spud's Waterfront Dining in Murrells Inlet for an indepth discussion about the Coastal arena project with the investment group's consultant, Tom Herron, Bill McKown, and Scott Perez. 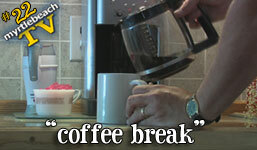 Watch episode 22, "Coffee Break", in its original HD format, by clicking here, or by clicking on the photo above.